Step 2 In a bowl add the mozzarella, cream cheese and butter. Melt either in the microwave for 30-60 seconds or over a bain marie (saucepan of hot water). Step 3 Add the beaten egg and coconut flour and mix into a dough, making sure all ingredients are combined well. Step 4 Lay the pastry on the prepared baking sheet. Step 5 Place the dough on a sheet of parchment paper. Place another sheet on top and roll out into a large circle, about 5 mm thick. Step 6 Mark a circle in the middle of the dough (I used a dessert bowl for the circle outline) and with a sharp knife, cut 4 lines into the center of this circle. You want to make a star of triangles that you can pull back towards the filling. Step 7 Spread the cranberry jam around the middle of the centre and top with the sliced brie. Step 8 Cut the outside edge of the ring into strips about an inch wide. These are going to be pulled over the filling. Step 10 Place on a baking tray and bake for 25 minutes until golden. Step 11 Remove from the oven, slice and serve. Note: When I removed mine from the oven, I scored over the folded strips to give the wreath a bit more definition. 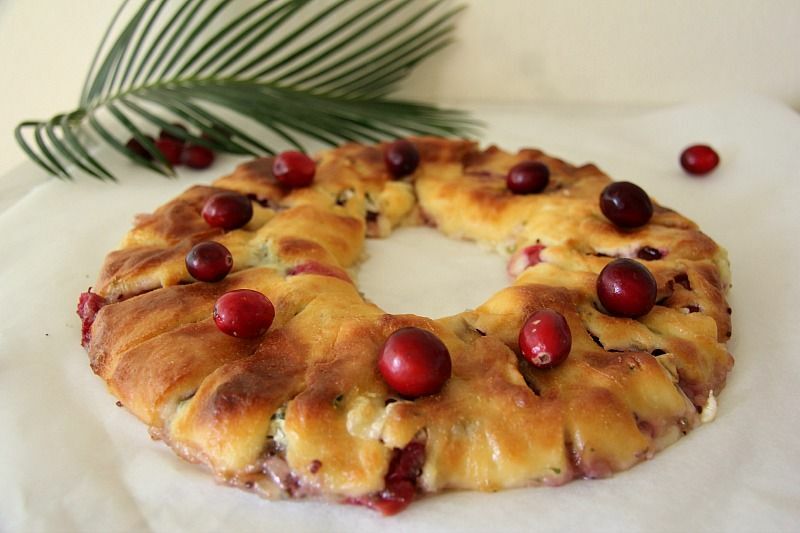 A cranberry brie ring made with fat head dough makes a delicious Christmas centrepiece. Serve as a vegetarian main or sliced for an appetiser.